An spray of roses over your lunch table? This is the Pacific Restaurant in the Metropole building on Avenue des Spelugues. What an elegant setting. All it needs is DH and me sitting there with a glass of wine! 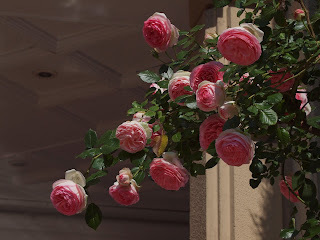 These roses are nice, but I remember the roses in the Princess Grace garden in the Fontveille section of Monaco near our hotel. Nice! A table for 2 please, Maitre d'H! Very nice setting for a meal. Hope they haven't got greenfly. Would hate for anyone to get bugs in their cream teas! Oh, how pretty! I can imagine a leisurely afternoon of tea and conversation at this cozy spot! 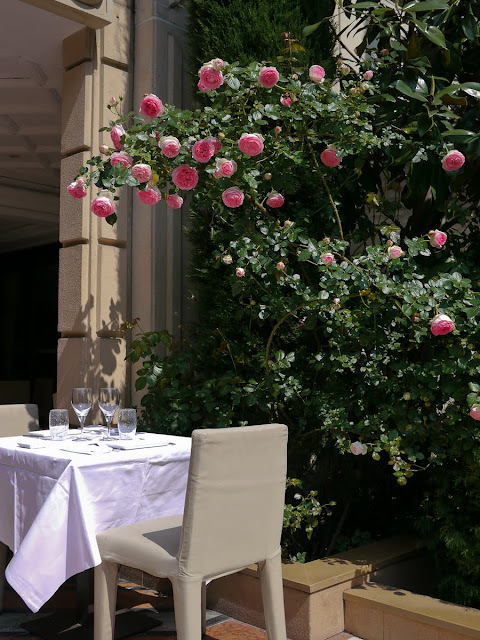 Déjeuner sous les roses ? Oh oui !